Symach is delivering its first shop in Riyadh to Elite Automotive Alliance (EAA)- another VW dealer recently launched. EAA has three facilities so far being at King Abdullah Road, khurais road and At exit 17 respectively. 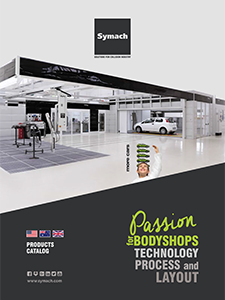 The new bodyshop is designed with FixLine formula which can produce 50 repairs per week with a key to key time of 2 days average for 85% of the repairs, all drivable cars. Fixline is the modern concept with new layout and repair process in terms of productivity, quality and service. It uses three different repair and layout processes,based on the number of panels to be repaired. In this manner, EAA’s service system is capable of optimising repair times and reducing labour costs by as much as 4 to 5 hours for each repair. Moreover, this new shop is just the first step of a bigger one, this because FixLine is also modular concept and so in the future it is possible to expand to 120 repairs per week. Led by Mr. Kamal Hajj, the director of after sales, and having the full support of the company’s managing director, Mr. Faisal El Sief, EAA is going to have the first Symach body center in the region with the automated system that surpasses the number and speed of repair of any conventional body shop. In participation with the Symach consultants, the realization of the new solution and new concept will become operational in June 2015. Symach proudly announces, encourages and supports EAA because it will be their first venture in this part of middle east.